cardholder emails – Super Library Marketing: All kinds of marketing ideas for all kinds of libraries. There’s no arguing this point: next to the face-to-face, daily interaction between librarians and customers, a card holder email list is your most effective library marketing tactic. If your library isn’t already collecting, tracking, and sorting card holder email addresses, please start… now. How do your cardholders learn about new services? How do they find the book they didn’t know they should read? How do they figure out how to use parts of the collection they didn’t even know existed, like video streaming or eAudiobooks? Tell them all about your library’s awesome resources by talking to them through their inbox. 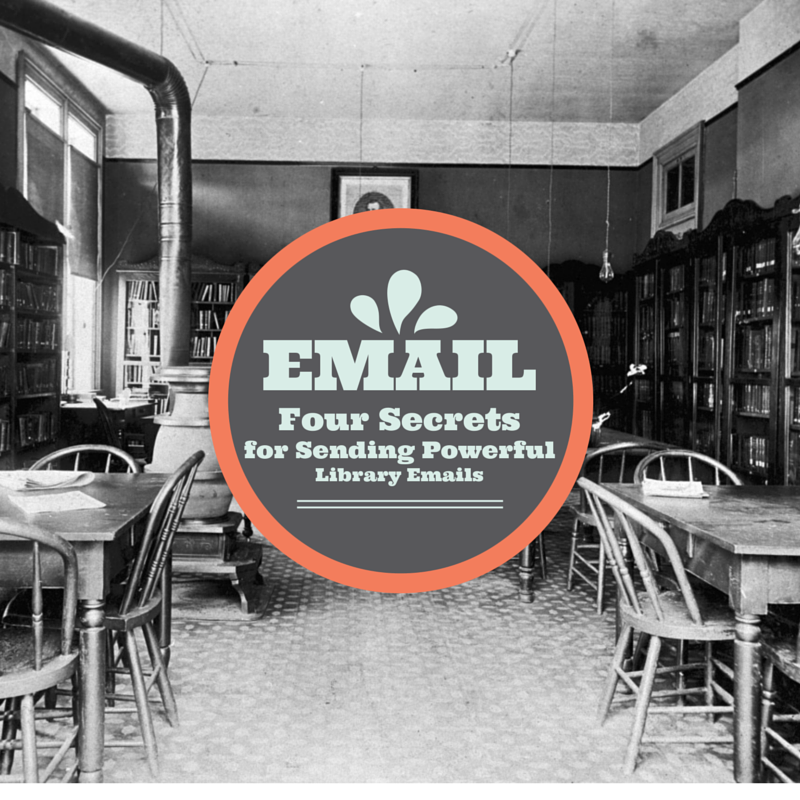 Here are four secrets that I’ve learned in the process of creating email messages for my library. These key points have led to higher circulation rates and card holder usage stats for us. They’ll work for you too! Be super-targeted. Start by picking one customer persona and creating an email which specifically targets that one group of people. Don’t worry that you’ll only be sending the email to a few hundred or a scant thousand cardholders. This is not a waste of time. The more targeted your email is, the more relevant and effective it will be. Your click rates will actually go up when your emails are extremely focused. I promise! Give your cardholders something of value. Everything in your library’s collection has a monetary value. Make sure your cardholders know this. Show them how they can save money or time by using their library card. Write the copy text in clear and simple terms and lay out the value of your offer in a prominent way. Harness the power of a great subject line. The subject line is the first thing your cardholders will see. For me, it’s the most important part of the email. Make it the best copy. Spend time crafting it. Don’t be corny and don’t use cliché’s. Use clear, simple language and stay away from passive words. Use a headline analyzer (this one or maybe this one) to help you create a subject line full of powerful, emotional language while maintaining the proper character length. Make it easy for your cardholders to take action. Include multiple calls to action within your email, in various places including the header text, in the body of the email, and in the footer. Within the body of the email, place your call to action within a box or a circle resembling a button, with the words in a large, clear font: “Place a Hold on Charlotte’s Web Readalikes” or “Watch Streaming Movies Now.” When you write this button, use the words “I want to…” in your head and imagine your card holder has seen your email and is saying to him or herself, “I want to do that!” What is the “do that”? That’s your CTA button! Now it’s time to decide on the perfect time to send those emails. I can help with that too! Are you actively sending emails to your cardholders? What has worked for you–and what hasn’t? Please share in the comments section! Connect with me on Twitter. I’m @Webmastergirl. I’m also on LinkedIn, Instagram and Pinterest.